​Originally located with sister business and much-loved Adelaide Fringe venue Rhino Room, The Howling Owl has previously hosted successful Fringe seasons for high profile comics including Joel Creasey, Lehmo, Dave Thornton, Lindsay Webb, Greg Fleet and Gordon Southern. In 2018, The Howling Owl proudly presents yet another season of must see comics. 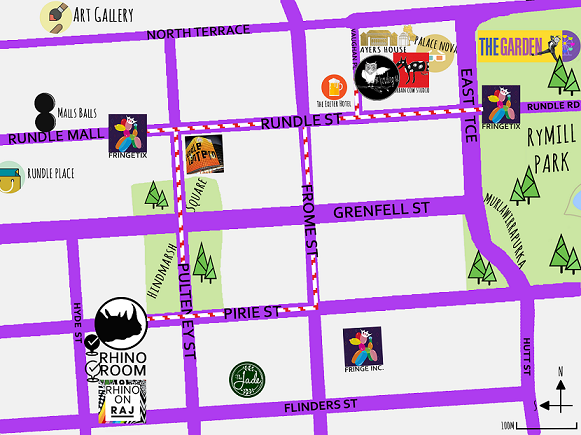 With shows 6 nights a week in an airconditioned, larger performance space we look forward to welcoming everyone to our first Adelaide Fringe in our new home located in the heart of Adelaide’s East End at the corner or Vaughan and Cinema Place. Come enjoy a pre or post show drink at one of our two bars. Perch on the balcony or grab a table outside to soak up the East End Fringe feels. ''How to Spend 72 Unforgettable Hours in Adelaide''.